After four years, four seasons, and three (and almost a fourth) live-action sibling films, Disney XD’s pre-Episode IV, pre-Rebel Alliance animated series, Star Wars Rebels, is set to take its final bow. Disney’s flagship Star Wars series, Star Wars Rebels is an engrossing, universe-expanding watch that benefits from both the sturdy mythological framework the prequel and original film trilogies provides, as well as from the gargantuan gap of nearly infinite, anonymous rebel action that separates them. It is also nearly impossible to just drop into, if you haven’t been either watching from the beginning, or bingeing in anticipation of tonight’s finale event. So instead of trading guesses about how Ezra Bridger (Taylor Gray), Hera Syndulla (Vanessa Marshall), Sabine Wren (Tiya Sircar), Zeb Orrelios (Steven Blum), ex-Imperial Agent Kallus (David Oyelowo) and all the rest will survive their final, pre-Episode IV showdown, let’s instead talk impact. The first universe-expanding project Disney mounted after acquiring Lucasfilm in 2012, Star Wars Rebels has, from the start, been a unique, almost alien addition both to the Mouse House and to the Star Wars legacy. 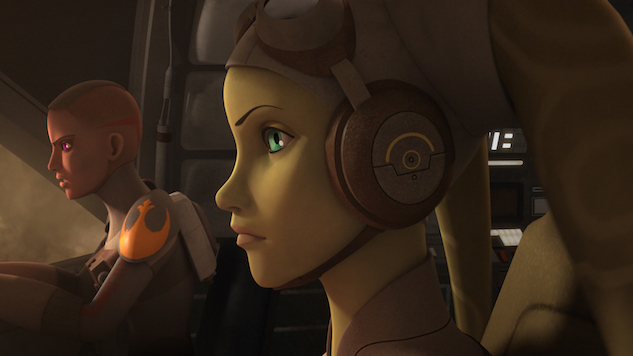 Following the exploits of Hera Syndulla’s freedom fighting Spectre crew as they scrap and battle their way into what will eventually be the Rebel Alliance, the CGI-animated series is highly serialized, darkly serious, and full-to-bursting with actual—if bloodless—death. (“There was a real emphasis [from Disney] on wanting to do something far more comedic than what we were prepared to do,” Lucasfilm’s Kathleen Kennedy told The Hollywood Reporter in 2015, ominously.) While the Expanded Universe is enormous and gets more interwoven every day, Star Wars hasn’t had to sustain a single, continuous story featuring the same set of characters across so many consecutive hours until now—Cartoon Network’s similarly CGI-animated Clone Wars was longer, but less serialized. Disney’s television brand, meanwhile, has historically been known as the antithesis of all stories dark, death-filled, or serialized, and has no other CGI footprint. This is not to say that Star Wars Rebels is unprecedented. While the sustained story it has been telling since 2014 has established a shift in how Star Wars stories can be told—especially stories about characters beyond the Skywalkers, Solos, and Reys/Finns/Poes of the films—the show’s subject matter (Empire vs. Rebels vs. Force) is deeply, deeply familiar. The Wookiepedia entry summarizing the history of Lothal (Ezra’s home planet), alone, is nearly as long and as punctiliously cited as that of Tatooine. Film characters do flit in and out. Clone Wars’ Padawan Ahsoka Tano makes a season-long cameo. Star Wars, as people know and love it, is in Rebel’s bones; there’s little new to see here other than a bunch of humans with distractingly normal Earth names. In terms of general darkness, meanwhile, while Disney’s original programming may usually shy away from death and severe physical and emotional trauma, darkness isn’t groundbreaking for kids’ storytelling as a whole—Avatar: the Last Airbender and its sequel, The Legend of Korra, tackled just as much morbid complexity in their runs on Nickelodeon, for two especially excellent examples from non-Disney television. In film, the trend is even more common: The significant characters in kids’ animated films have been found 2.5 times more likely to die than those in films for adults—a statistic Disney itself has no small part in. The CGI animation, too, has precedent beyond Disney’s borders: It is, specifically, the same CGI animation that was used by series EP Dave Filoni and his creative team over at Cartoon Network for Clone Wars, down to the same software (Autodesk Maya) and much of the same animation team. Some updates were made for the Disney XD series—a shift in aspect ratio, down to the less cinematic 1.78:1 from 2.39:1; more dynamic eye colors with white Avery dots added in—but for the most part, the design is stuck in the the amber of what was possible and aesthetically interesting in 2008 (when Clone Wars premiered). Where Star Wars Rebels has stood apart from its decade-old sibling, though, is in its many flashes of extraordinarily interesting, non-CGI artistry: the vantablack electric crackle of the Mandalorian Darksaber, the line drawing animation of the Darksaber’s legend; the otherworldly deep white-silver of the neutral Force-wielder Bentu’s unseeing irises; the Teen Titans Go!-adjacent 2D graffiti Sabine leaves on the walls of any and every room she spends time in; the 2D gilded Mortis triptych that self-animates on the door of the Loth-wolves’ ancient temple; the celestial blueprint “World Between Worlds” dream animation said mural leads to. With those explosions of inventive, non-traditional animation splashed across the series, even the bluntest of 2008’s CGI modeling (e.g., hair that looks like tongues of rubber, skin with the texture of a pudding pop) feels purposeful: For a kids show whose fantastic scale and unceasing violence preclude live action, but whose mythology necessitates as much visual depth and dimensionality as possible, 3D CGI is the best middle ground. And while the trailer for the 2017 Battlefront II videogame demonstrates that Star Wars-adjacent CGI has made incredible advancements in the last decade, the bluntness of the Clone Wars-era animation serves the dual narrative purpose of very literally blunting the darkest parts of the series’ subject matter. The extra shiny, extra modern bits of experimental animation weaving in and out of the series has kept Star Wars Rebels deadly relevant; its soft, throwback normcore edges has made it safe for kids to get gut-punched by the most harrowing aspects of that deadly relevance without getting destroyed. So Disney XD’s Star Wars Rebels has, in the end, managed in the course of five years to do exactly what the Star Wars franchise as a whole has done so successfully these past many decades: Taking what has worked before and building it out and on and up. It’s not a show that seems like it should have worked for the network or the franchise, and yet it has not only come four long years to reach a natural, thrilling end point, but has also paved the way for the much more stylized, a-realistic 2D animated Star Wars Forces of Destiny series of female-fronted shorts to take up residence on Disney’s flagship channel, which, in turn, is likely to pave the way for something new. Even if the Jedi order is able to survive tonight’s finale (dun dun DUN), we know from Episode VIII that it won’t survive indefinitely. But Star Wars Rebels, and Star Wars Forces of Destiny, and whatever comes next, are all more than ready to tell fans the story of that future, or any other. The series finale of Star Wars Rebels airs tonight at 8 p.m. on on Disney XD. All episodes (Season One through Four) are available to stream On Demand and on the DisneyNOW app.